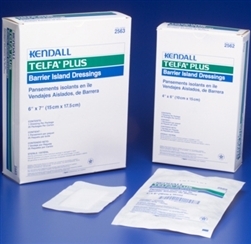 Kendall TelfaTM Plus Island Dressing is a super absorbent pad to provide maximum performance, and soft nonwoven backing conforms and seals wound on all four sides. It is available in convenient sizes for surgical and chronic wounds. TeflaTM Plus Island Dressings features unique mylar film to minimize wound trauma during removal. They also have a unique back-sheet film that provides a fluid and bacterial barrier beneath a conformable non-woven backing.